The Grammy Award-winning Brooklyn Tabernacle Choir will release its 29th album via Provident Distribution on Feb. 10, 2015. The CD entitled, Pray, features 14 new songs, 11 of which were co-written by choir director, Carol Cymbala. Cymbala believes that choirs are still an integral part of congregational worship. "The ultimate purpose of a choir is to lead the congregation into the presence of God, " Cymbala says. "Prayer is vital. Preparing the choir spiritually is so important. I do feel strongly that the idea of many voices lifted up to the Lord, unified and in harmony, is a powerful thing. We also read of choirs in the Bible going forth and singing before the battles were waged." The Choir will premiere the new recording on Sunday, Feb. 8, at the Brooklyn Tabernacle, 17 Smith Street, Brooklyn, New York, at 3:00 PM. is produced by Carol Cymbala and Jason Michael Webb. Since its inception over 40 years ago when the Choir began with only nine members, Cymbala has never read music—though she has written numerous hit songs—and the choir has never used charts. The 300-voice choir is a blend of ethnic and economic backgrounds, with members ranging from lawyers and doctors to former drug addicts. "While the new Pray CD has an eclectic mix of songs, " says Cymbala, "it is also reminiscent of the traditional Brooklyn Tabernacle sound. Beyond the songs, I really believe that it is very important that the members of our choir—or any choir—should have a heart for God and a heart for ministry. Ultimately, we need to focus on seeing lives changed through the power of the Gospel in song. I pray that there would be more choirs that would be raised up in the day that we are living in so that we can sing a song of victory to our God because He is worthy of all our praises." The Brooklyn Tabernacle Choir has performed at major music venues, such as Radio City Music Hall, Carnegie Hall and Madison Square Garden. Their accolades include six Grammy Awards, seven Dove Awards (Gospel Music's Grammy equivalent), two No. 1 Billboard charting CDs and over 4 million albums sold. The choir sang "The Battle Hymn of the Republic" at President Obama's second inauguration ceremony on the steps of the U.S. Capitol to a worldwide television audience of over a billion people. The Choir has performed on various national TV shows, including Good Morning America and Fox and Friends, among others. 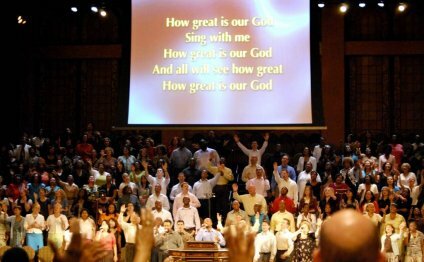 Brooklyn Tabernacle Choir was featured on the cover of The New York Times and highlighted in Time Magazine. The choir's previous CD, Love Lead the Way, debuted at No. 1 on the iTunes Christian/Gospel album chart last year.